A teaching career is a valuable one as teachers equip today’s students with the skills and knowledge they will need to succeed in this age of technology. Middle school teachers have an essential role in working with students around the “tween” age, as they leave childhood, and approach and enter their teenage years. These students are at that impressionable age in which middle school teachers can make a significant impact on their lives. Introducing art as a valuable part of life, for pleasure and perhaps eventually for profit, is part of the role a middle school art teacher fills as students learn to explore and develop their creative skills. Middle school includes grades six through eight, and students in middle school are usually in the 11- to 14-year age range, depending on where their birthdays fall in relation to the school year. Middle school teachers serve an essential role in building upon the foundation children gained in elementary school, and preparing them for successful entry into high school. The minimum degree for entry-level middle school teaching jobs is a bachelor’s degree, while middle school teachers working in public schools must have the appropriate state-issued teaching certification or license. The Bureau of Labor Statistics (BLS) projects a 17 percent job growth for middle school teachers between 2013 and 2020, which is considered about as fast as average among other industries. In order to become a middle school art teacher, you will need a minimum of a bachelor’s degree, usually in elementary education. You will also need to major in your specific content area of art, as well as take basic education and child psychology courses, among others. You will typically also need to enroll in your university’s teacher preparation program. Your college courses will teach you how to work with middle school-aged students of various abilities and backgrounds, along with how to effectively present information in a manner that makes the concepts easy for students to understand. Most teaching programs also require you to fulfill a period of time doing student teaching to get practical, hands-on experience. After earning your degree and student teaching practicum, you will need to pass a general teaching certification test. In addition, you will need to pass a test in which you demonstrate ability in the area of teaching art. Check with your own state department of education to ascertain whether you might also be required to earn your master’s degree after you obtain your teaching certificate. While middle school art teachers who work in private or religious schools are not required to meet the same state requirements for teaching, most private schools still prefer and hire candidates who have a minimum of a bachelor’s degree in elementary education, as well as demonstrated experience teaching art. Adult learners often have numerous demands on their time. They might already have jobs and family obligations. The beauty of online education is its flexibility and convenience that allow you to pursue your degree in middle school art education while still meeting those other obligations. Even in online education teaching degree programs, however, you will still need to complete a specified period of time in a classroom, to gain hands-on experience as a student teacher. Check with an administrator in your area, as well as with your school program director after you are enrolled, to determine how to fulfill your student teaching requirements. 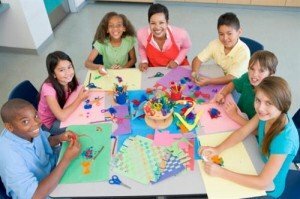 If your state department of education requires you to earn your master’s degree in middle school art education after you have your bachelor’s degree and your teaching license, this is another way that online education will prove to be a valuable option over attending classes in the traditional manner. We can help you find the right school program for your needs. Just fill out our handy sign-up form to receive all the important details about the school/s that interest you. Then, fill out your Free Application for Federal Student Aid (FAFSA), and go apply. Here at Web College Search, we can provide valuable articles and other information to keep you informed as you begin or continue your educational journey. According to May 2012 Bureau of Labor Statistics (BLS), nearly 621,000 middle school teachers were employed nationwide. The median annual wage was $53,430, but annual wages ranged from a low of $36,740 to a high of $82,190. The job outlook for middle school teachers from 2013 to 2020 varies regionally, but the BLS predicts a faster than average growth for jobs in the country’s southern and western regions where student enrollment is expected to increase faster than in the midwest, where enrollments should remain steady, and northeastern regions, projected to see declines in enrollments.